Gerald Nielsen, president of The Nielsen Company, receives the Going for Green Business Award from Darien Chamber of Commerce Executive Director Susan Cator. DARIEN — The sun is out for longer hours now and that bodes well for The Nielsen Company. The Nielsen Company, a commercial real estate developer that boasts over 250,000 square feet of commercial space in New England, installed a 129 kilowatt solar array on the roof of its 6 Thorndal Circle property. The project began last September and came to completion in mid-December. “Over the useful life of the panels, which is estimated to be greater than 20 years, the 6 Thorndal Circle project will produce 4,622,715 kilowatt-hour, which equates to taking 736 cars off the road for a year,” Nielsen said. 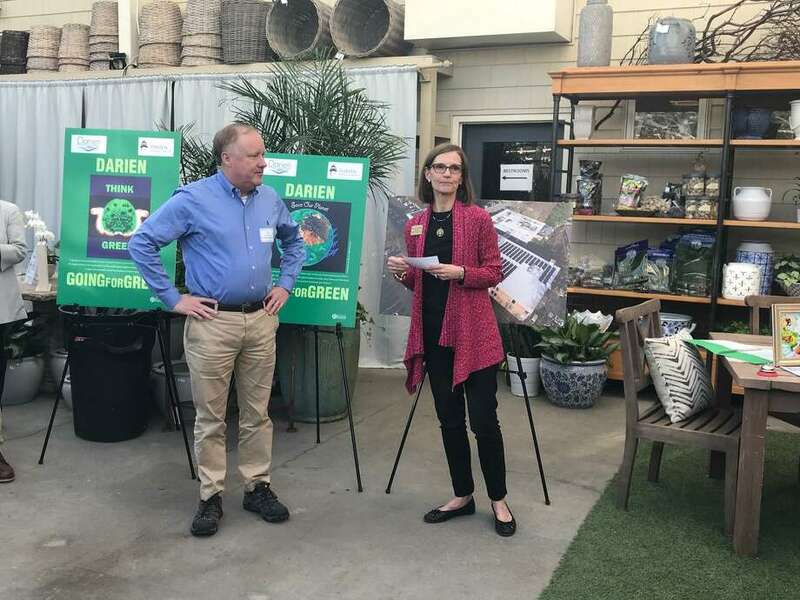 The Darien Chamber of Commerce, which has been promoting local businesses to focus on environmental efforts, awarded the Nielsen Company the Going for Green Business Award last Wednesday at its 11th annual “Going for Green” event. The coming spring and summer months will boost the energy levels produced by the solar array. “Results are right on target with what we expected. As days get longer we’re able to obtain more and more energy. We’re really looking forward to May, June and July for our future energy demands,” Nielsen said. The company’s environmental initiative also required structural changes to its property. The solar panels installed on top of 6 Thorndal Circle demanded the renovation of the roof as the building was one of the older ones owned by the Nielsen Company. “There was a concern that panels on a flat roof sometimes fail so we incorporated that into two projects, a roof renovation and the installation of the panels,” Nielsen said. The timing of Nielsen’s foray into solar energy matches up with that of the town. Officials announced back in late February that they had chosen Encon, a Stamford-based company, with which to enter into a 20-year solar energy contract that could save the town half a million dollars in that span of time. Selectman Pam Sparkman, who has advocated for environmental initiatives and efforts, lauded the company’s efforts. “The implementation of solar panel highlights their business leadership in Darien and complements the green changes we as a town are making adding solar panels to our Town Hall, Police Station and Department of Public Works,” Sparkman said via email. So far, the local business is satisfied with its results and there are plans to continue installing solar arrays on other company-owned properties. “We’re looking at another project for later this year, probably in September, for 28 Thorndal Circle,” Nielsen said.